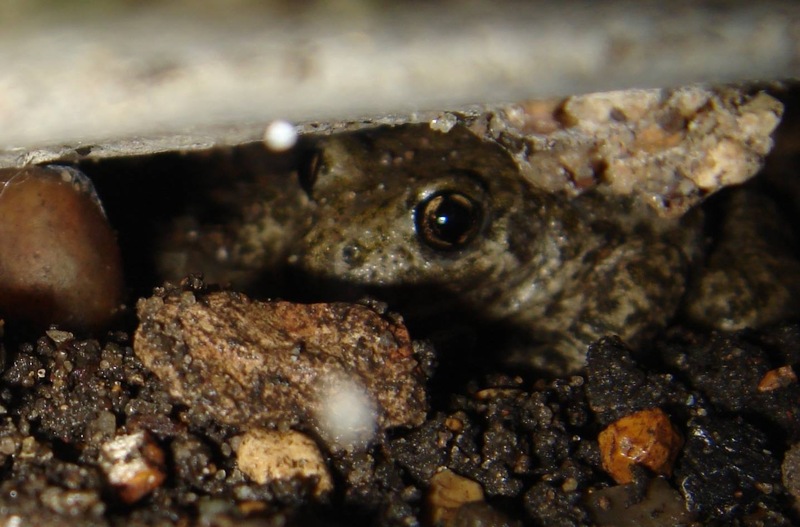 It may surprise most people (especially the residents of Cambridge), that an isolated population of a non-native toad exists within the heart of the city. I’m not entirely sure how the toads became established as there are a number of different stories surrounding their arrival and establishment. One of my concerns, as with any non-native species, is the impacts the species can have on native species. Midwife toads (Alytes obstetricans) live happily with the other amphibian species found in the UK, on the European continent so there isn’t a risk of our native species being out-competed. This is because the midwife toads have a vastly different ecology and life history compared with our native species. One risk that the toads may pose is as a disease vector of the amphibian chytrid fungus, Batrachochytrium dendrobatidis. The chytrid fungus has been implicated in the decline of amphibian populations globally and the extinction of 200 species. With some colleagues I discovered the population in 2015 after 3 years of following up anecdotal reports. I remember the night we first heard the toads calling in the dim light of the summer evening. 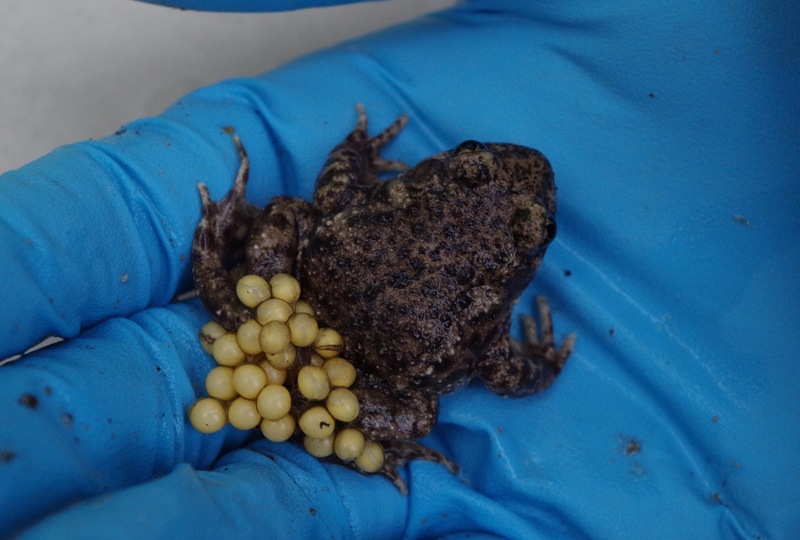 Over the next few weeks we worked to locate the toads visually – we did this with some success, even finding a male carrying eggs. This was a sure sign that the population was breeding despite the fact that we are still to locate the breeding pond(s). Unfortunately the toads aren’t easily accessible; they are situated in some isolated and secure rear gardens of a residential area. We’re grateful of the local residents to allow us access to their gardens in order to survey for the toads in order to get a better idea of the population size. To do this, we’ve been taking photos of the dorsal surfaces of the toads in order to recognise each individual. Again in 2016 we were able to find males carrying eggs – a sign that they have been successfully breeding over the past 2 years. 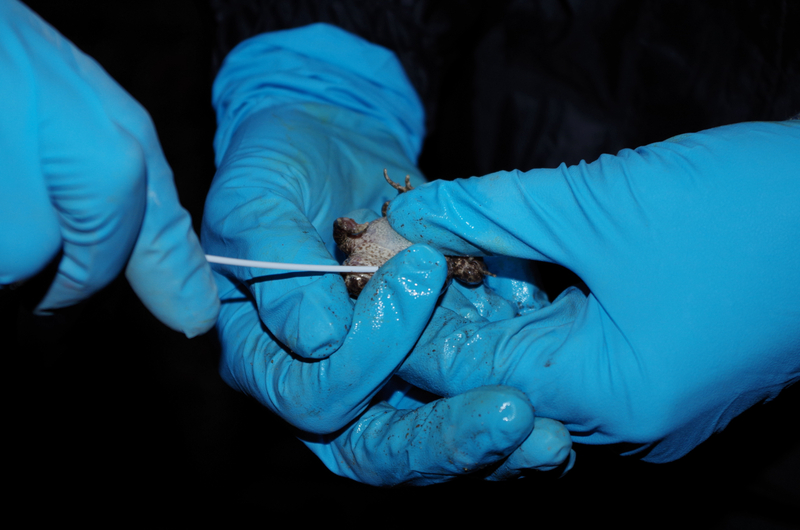 In 2016 we were able to secure the correct license to allow us to handle toads and swab them for chytrid. The toads are extremely hard to locate due to their cryptic nature and small size. The swabs we’ve taken are soon to be sent to a lab for analysis – we’re hoping that swabs come back negative. If the swabs come back positive then we will have to consider mitigation – this may involve swabbing the native amphibians that also inhabit the same gardens to see if the disease has been transmitted to them. If the toads turn out to be free of the disease and the native amphibians are infected with the disease we will be placed in a difficult predicament. In 2017 we plan to continue swabbing the toads for the presence of chytrid as our sample size at this moment in time is shamefully small. I’d like to take this time to thank ARG UK for funding the testing of our first batch of samples with the 100% Fund. Keep an eye out for future updates.